Manufacturer and Supplier of Structure Glazing. Our product range also comprises of Aluminium Ladders, Polycarbonate Canopy and Fall Ceilings. 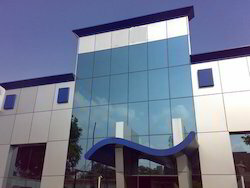 We offer to our clients quality Structure Glazing that is manufactured from superior quality raw material. This range of Structure Glazing offered by us is manufactured in vibrant designs and distinct patterns. The aim is to create a desired product that best suits the client’s requirement. We have the capability to meet any urgent requirement irrespective of the size of consignment.